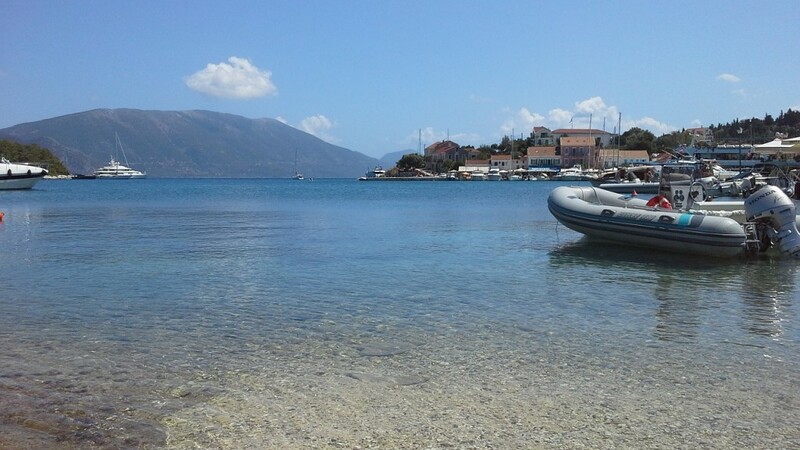 My love affair with Kefalonia began some time ago now when, in my early 20′s, I visited the island for the first time after repeatedly watching the film ‘Captain Corelli’s Mandolin’. I instantly fell in love with best Greek Islands and the many images of pretty little beaches and coves, where aquamarine water lapped at the pebbles and the sunbathers soaked up the rays of the hot Greek sun. When I arrived at my destination (the pretty little resort of Lourdas) I certainly wasn’t disappointed and further holidays have only proved to further cement my infatuation with the island. You’ll find that, even now in the early 21st century, the island still has an unspoilt feel about it and it’s a much quieter destination than the party islands of Mykonos and Zante (sometimes called Zakynthos) which many younger people prefer. Don’t worry though; you can still dance the night away if you feel like it during your stay, as the neighbouring island of Zante is only a short ferry ride away. The first time I visited I made the terrible mistake of hiring a tiny Fiat Seicento with no air-conditioning to keep me cool, during the hottest time of year in August when the mercury regularly soars into the 30′s. The Ionian Sea was beautifully warm at around 26°c and I remember many days of darting into the water to cool down, only to have to repeat the process 20 minutes later when I started to overheat again. The typical beach on Kefalonia consists of crystal clear blue water with pale sand giving way to bigger and bigger pebbles as you head towards the sea (don’t forget to pack some flip-flops to protect your feet) and you’ll find plenty of opportunity to go snorkelling in the rocky bays which are home to many species of fish and plant life. If you like slow and relaxed meals and all inclusive family vacations then you’ll love Greece as lunch and dinner usually take around 2-3 hours each – a real change for someone like me who’s used to a fast-food lifestyle – and the simple but tasty dishes are simply beautiful, especially the baked Feta or grilled Haloumi cheeses which are simply divine. A welcome break from the ever present sunshine, a trip to the spectacular Drogarati cave feels like entering another world and you’ll get some amazing pictures of the many stalagmites and stalactites if you’ve got a good flash on your camera. After walking down the sloping 45 metre long corridor, you’ll enter the main cave which makes for an awe-inspiring sight. It’s even played host to a variety of concerts in the past due to the perfect acoustics down there. In my opinion this is one of the most beautiful beaches on Kefalonia, but be warned, it does get very busy during peak tourist season. A trip to the beach will reward you with a glimmering white beach – don’t get too excited it’s made up of pebbles again – with some of the cleanest and bluest water I’ve ever seen on a beach, even compared to the Carribean islands I’ve visited. Make sure you stay till sunset for a beautiful display as the myriad of colours are reflected on the water, making for a truly magical experience. I spoke to a few friends who had visited the Melissani cave before I flew over to Kefalonia for the first time and whilst some of them said it didn’t live up to all the hype, I found it certainly exceeded my expectations when I got the chance to visit. I too was taken round the ultramarine water within the first cave by a singing boatman, and the effect of the sunlight streaming through the open roof of the cave gives the effect of the water being lit from below – truly spectacular on a sunny day. Although the island is generally very quiet, there is nightlife to be found in the capital of Argostoli which has a variety of tavernas to choose from. You’ll also find an excellent fruit and veg market and there are some excellent jewellers and speciality shops if you fancy splashing the cash whilst you are there.